Dusk in Kalamazoo has never been so sweet, especially at the festival-like night market, an evening farmers’ market devoted to all things summer – fresh Michigan produce and locally prepared foods; live, outdoor music and dancing; and dozens of artisan handcrafted goods from soaps to t-shirts to piñatas. 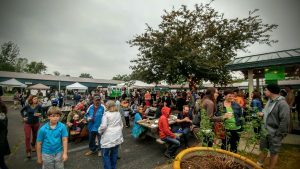 “It’s a fun place to be, not just to shop,” says Chris Broadbent, farmers’ markets manager for People’s Food Co-Op of Kalamazoo (PFC). 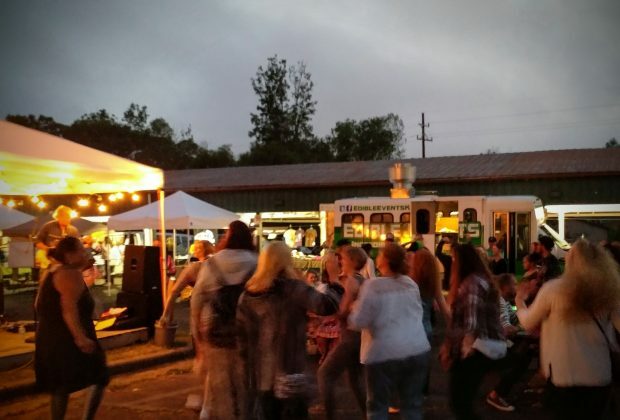 Broadbent says that PFC, which operates four farmers’ markets in the Kalamazoo/Portage area, has been intentional about providing reasons for patrons to hang out a while at the night market. “It’s a social place, a social scene. People come to meet up and celebrate our food culture,” says Broadbent. Some folks even bring their own lawn chairs, like they might for an outdoor concert or movie in a park, so they can stay to enjoy the music for hours, if they choose. 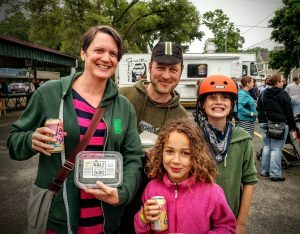 Can-Do Kitchen, a nonprofit that provides support for entrepreneurs through commercial kitchen space, food business incubation, and workshops, sells local beer and wine at the night market as a fundraiser. “This event is a great opportunity to promote the Can-Do Kitchen and get people talking about what we do,” says Sheena Foster, director of operations and experiential learning at Can-Do Kitchen. She says that offering beer and wine provides more of a night-on-the-town feel to the night market. The night market allows people who may not be able to attend the daytime markets an opportunity to support their area farmers, local businesses, and a nonprofit. 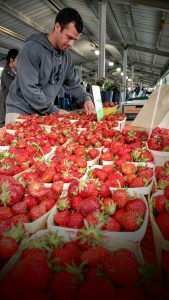 “We've had quite a few people tell us it's their first time attending any of the farmers’ markets,” says Foster. Not surprisingly, there is an undertone of healthy living at the night market, with its wide array of fresh produce, prepared foods, and handmade health products. Also, people with limited resources can use various food-assistance currencies, like WIC Project FRESH coupons, Double Up Food Bucks, Hoophouses for Health vouchers, and Bridge Cards (food assistance), making the market affordable and accessible for all community members. Market organizers are also encouraging people to ride bikes to the night market, providing a free bike valet to shoppers. Those who arrive on two wheels don’t have to worry about locking their bikes, but, rather, are treated like VIPs with the valet service. Broadbent says the market also started a Bicycle Benefits program, a growing national program where a $5 sticker placed on a bike helmet means patrons can enjoy discounts, incentives or rewards for biking to businesses. Twenty vendors at the night market participate. One vendor, who sells kale chips, rides to the market, transporting goods on a bike trailer. Night markets are held at the Kalamazoo Farmers’ Market building, 1204 Bank Street, near Lake and Portage streets. An extra July market will be held at the Kalamazoo Growlers Baseball Club Homer Stryker Field on July 14 and will feature live jazz. 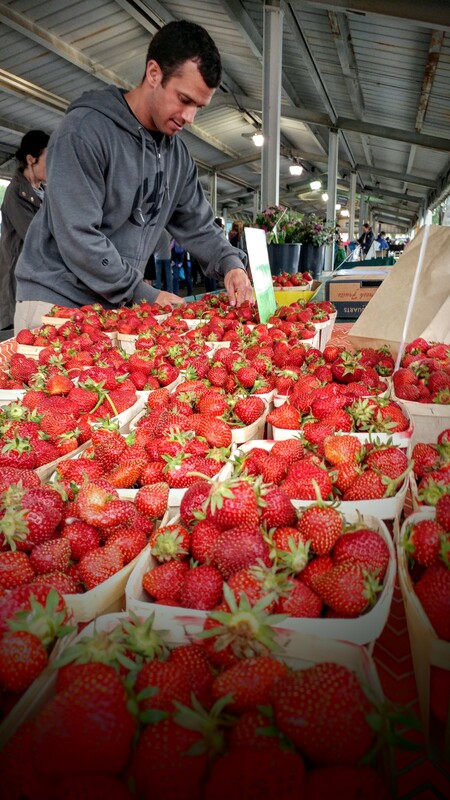 TAKE ACTION: Support the growers and local producers who bring their goods to farmers’ markets in your town. Even better, ride your bike to the farmers’ market for better health and to lessen traffic congestion and fuel emissions.